Sophisticated crook (Robert Stack) talks ex-crook and now respectable business man (Jean Gabin) into one last caper! 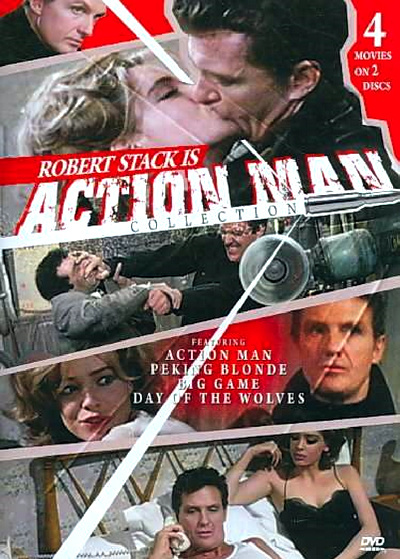 This highly planned and well executed crime goes off without a hitch until rival bad guys want a piece of the action and kidnap the wife of Gabin. Stack, in order to make things right and bring the couple back together makes the ultimate sacrifice! Six highly trained criminals invade a small town intent on cleaning the city out of money. Known only to each other as #'s 1 through 6, with beards, identical clothes, special gloves, and their own missions, they begin the mayhem only to find that the recently fired town sheriff is more than a match for anything they had planned for. A top scientist seeks out and hires top military mercenaries for protection. Our scientist has discovered the means by which he can control military personnel and direct them to do his bidding. What are the goals that inspire his motivations? Based on the novel by James Hadley Chase, this cold war adventure pits beautiful femme fatales against the worst of the worst.